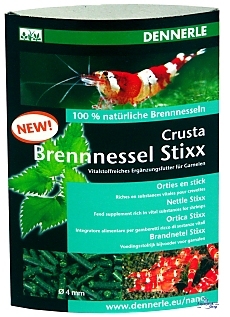 Dennerle Crusta Nettle Stixx are a tasty feed supplement for shrimps in fresh water aquaria. Feeding recommendation for Dennerle Crusta Nettle Stixx: Feed every 2-3 days as much as the shrimps eat within 24 hours (approx. 1 cm stick per 20 shrimps). Remove feed residues from aquarium. Click the button below to add the Crusta Nettle Stixx 30 grams SALE FREE shipping to your wish list.